Okay - here are my offerings. Once again, I apologize for the photo quality. If you guys only knew how many I have to take to get even these! Anyway, I forgot to resize my photos before uploading them, so I am posting links to the bigger files rather than risk the edge cutoff that the larger photos seem to cause. I have a bit of a love/hate relationship with this next one. I really think it is quite pretty, but I made it when I was just starting out as a knotter, and my knots leave a lot to be desired - there are big gaps between a lot of the pearls and beads. Therefore it irks the obsessive/compulsive part of me. In additions, the bits of silk tend to wrap around themselves and make it very difficult to figure out how to untwist the strands. I have to store it very carefully, and drape it very deliberately and use a shortener rather than just looping it around my neck. It is taller than I am (even looped), so I guess it's somewhere around 130" long. Last edited by boo; 01-03-2008 at 12:47 AM. Last edited by boo; 01-02-2008 at 08:20 PM. These are brown dyes FW pearls with brown tiger's eye, gold beads and "antique gold" rose beads crocheted together with copper wire. So, Sueki - what do you think? And this is my favorite bracelet: SS keishi from DruzyDesign with faceted tanzanite. 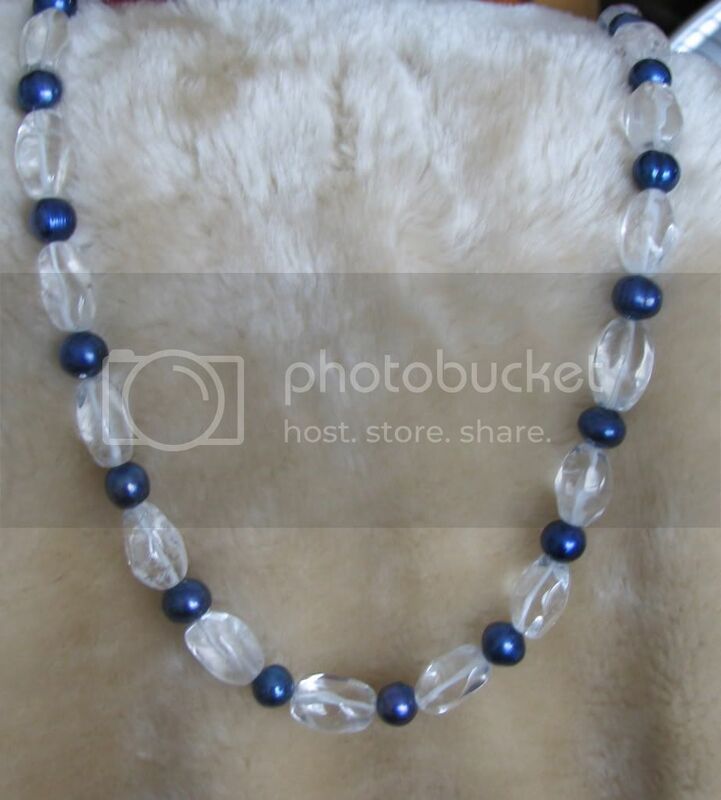 The second photo bleaches out the pearls a bit, but gives a nice idea of how the tanzanite glows. Neither photo does justice to the orient of the keishis. I normally wear the clasp in the back with my hair up. Last edited by boo; 01-02-2008 at 05:40 PM. Boo, they are all gorgeous; and I am speechless at the brown dyed freshwaters. What a fabulous way of using those pearls. I am delighted that they found their way to someone who can do them justice. Crochet wire work ? A stroke of genius. I am gobsmacked at the end result. I say again - lowly beaders? my eye. I can string and knot, and think of myself as possibly a lowly beader. I hereby award you an MBE - Member of the Beading Elite. When I first took up residence here, I was the first and only beader. Commercial quality freshwater pearls were the poor little step children, thus "lowly beader". Now I am just so impressed at how the imagination feeds on the atmosphere here, and the quality of design has gone up so much! If yall don't take it seriously, we could give Pearlitzer prizes to quite a few lowly beaders! Last edited by Caitlin; 01-02-2008 at 07:52 PM. Sueki, you are so sweet! I am glad you approve. Boo, you are so modest. I love your stuff. In fact, because of you, I have a bunch of sandals that need pearling! Everybody here does such great stuff!. Me I am pretty boring with my Historical "reproduction stuff". Doing it just becasue I can and to satisfy and itch to bead. What I like about everyones work is the individual flare to the creater of a piece! love it.. all are distinct and very insporational! You're bang on - my imagination has fed continuously since finding the lowly beader's club. I'd never have had the gall to try my hand at stringing and knotting, and certainly never have found the tips and wrinkles without these boards. Boo, you are indeed too modest. Ash, you, too are too modest - I've seen the photos you posted of the chalice cover and bag, for example. Long may you all reign. True Pearly Queens (and a Pearly King or two, I think).